When I was a young girl, Halloween was a big deal in our house. A perpetual kid, my dad loved to doff his wolfman mask and hand out candy to the neighborhood rugrats, but his favorite part of the holiday was carving the pumpkin. He’d sketch out his stencil weeks ahead of time, making minute changes until it was just right. Then he’d carefully cut open the top, scoop out the seeds (which, every year, we halfheartedly debated toasting) and copy his stencil onto the front of the pumpkin before carefully cutting out each component of the face. My pumpkins, on the other hand, were considered excellent if I managed to cut out the eyes without (a) cutting myself or (b) cutting the eyes too close together and causing the face to crumble in on itself. My dad’s all-time best pumpkin was the one he carved into a cat face for my cat-crazy mom. It had almond-shaped eyes, a triangular nose and an array of whiskers on either side of its fishhook mouth. My contribution was scooping out the pumpkin guts. But a few years ago, I finally saw a pumpkin that topped my dad’s masterpiece. 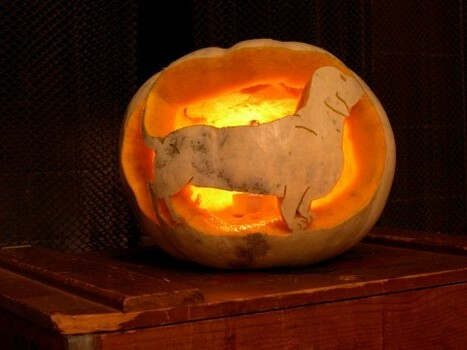 A faraway friend and her partner created a Dachshund pumpkin! A super-awesome pet-themed Halloween pumpkin is just a click away. I was impressed not only because they’d gone to the trouble of finding a Dachshund stencil, but because it was perfectly executed with skill that I will never, ever possess. But, hey, I can still try, right? If you’re absolutely tickled at the thought of carving the image of your pet into a Halloween pumpkin, it’s not as difficult as one may think. The hardest part of all? Finding the right stencil. You can buy them, if you like to spend money for no reason, but you can also download hundreds of free stencils for pet-themed Halloween pumpkins from the internet. If you are carving-challenged, try a super-simple dog or cat stencil. These patterns are great for families with kids (or klutzes, such as myself) who may feel overwhelmed by some of the more complicated patterns. Paper Pumpkins also offers a wide selection of breed-specific dog stencils that even I could carve. Artistic fans of particular dog breeds should head for the Better Homes & Gardens website, which offers beautiful, complex stencils for 24 dog breeds, including Beagle, boxer, German Shepherd, Bulldog, Chihuahua, Dachshund, Golden Retriever, Jack Russell terrier, Labrador Retriever, poodle, pug, Scottish terrier and Yorkie stencils. 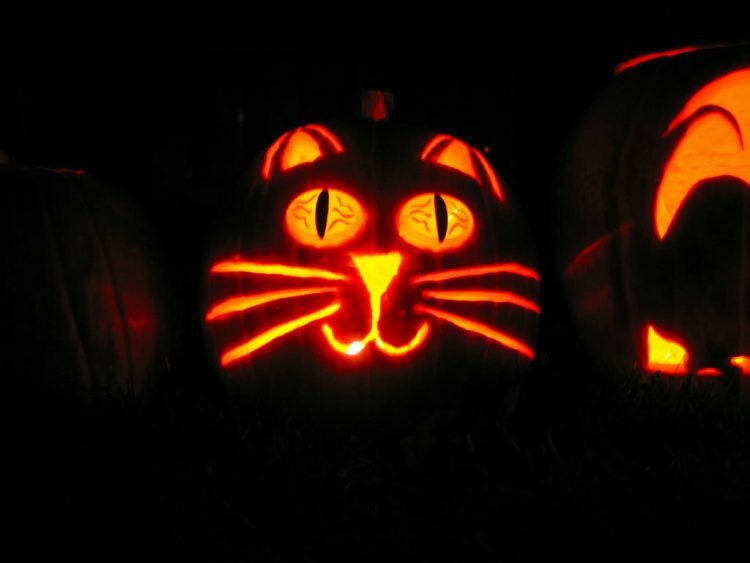 Although cat stencils tend to focus on the ubiquitous “scaredy cat” theme, Band of Cats has a few ideas for some cutesy cats, including some that should be attempted only by pumpkin artisans, as well as an interesting selection of non-Halloween cat stencils. If you are an all-around animal lover, check out the World Wildlife Fund’s Halloween pumpkin stencils, which include 9 different wildlife patterns. You won’t find dogs or cats, but you can carve a tiger, a polar bear, a butterfly and a gorilla, among others. Jack-o’-lanterns have long been a part of celebrating Halloween. Perhaps it’s even more fun when we include our pets in the tradition by carving their images. What kind of pumpkins do you carve for Halloween? Tell us in the comments!